I hadn’t realized that Eiichiro Oda’s One Piece (Viz) was popular enough here to get the Naruto Nation treatment. I know it’s huge in Japan, but I thought it was one of those books that sells very respectably if not spectacularly. (Favorite bookstore memory: seeing two stylish exchange students from the local university totally geek out when they saw One Piece on the shelf.) But Viz is releasing a whole bunch of volumes on a very accelerated schedule, and it’s been publishing omnibus editions of the early installments. 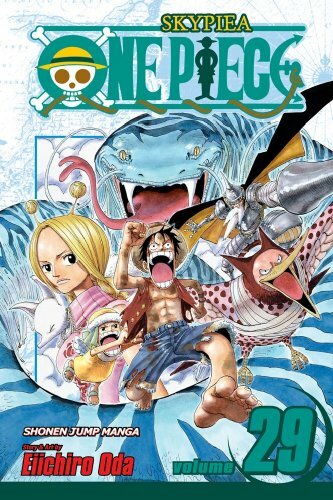 New volumes have also been cropping up in the manga section of the New York Times Graphic Book Best Seller List, though pirates don’t seem to have quite the commercial force of ninjas or vampires or James Patterson. In the interest of full disclosure, I should note that I read a handful of early volumes of the manga and enjoyed them well enough, but not quite enough to keep up. I don’t have quite the attention span for shônen that I do for some other categories. But the publisher recently sent me review copies of volumes 29, 30 and 31, which picks up roughly in the early middle of an arc about a mysterious chain of islands that floats up in the clouds, and it seemed like a good opportunity to see what’s up with the crew. 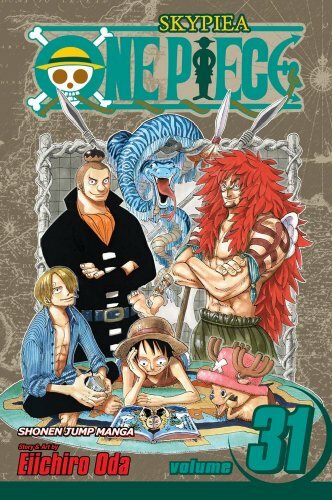 The Straw Hats, the pirates who form the comic’s core cast, are scattered throughout this floating island along with a dauntingly large number of guest characters representing different island factions. It’s not impossible to figure out what’s going on, but if you’re going to sample One Piece, I can’t recommend the 29th volume as your starting point. (I think the “Skypiea” arc starts in the 24th volume.) There’s an evil god who’s pitting all of these factions against each other, and our dimwitted hero, stretchable pirate Luffy, is on the path to becoming sufficiently annoyed to knock said god off of his perch. 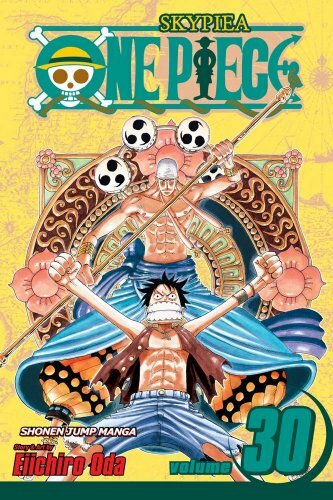 What makes me eager to see the conclusion is the fact that Oda takes a break from the floating-islands mayhem to take readers back to where everything started, centuries before Luffy was born, before he ever considered pillaging as a life calling. (Oh, and if you’re leery of cheering for a bunch of criminals, Luffy’s concept of piracy is really mild.) In the flashback, a botanical explorer finds one of the islands that will later take to the air and tries to befriend its imperiled residents. It’s shônen in miniature, with rivals becoming friends, skills displayed and shared, and brave promises of loyalty made, but it’s also moving and tragic. It gives heft to the main event, and it shows how focused and precise Oda can be as a storyteller. Beyond the fact that it works in the larger context, it’s nice to see something linear and restrained in the midst of the mad jumble. In other developments, there are two Straw Hats who are new to me. One is a tiny reindeer named Chopper who serves as the crew’s doctor and seems given to panic. He spends most of these volumes unconscious, which is unfortunate, because what sensible person doesn’t want to know more about a tiny, panicky doctor who’s also a reindeer? The other is a taciturn archeologist named Nico Robin who can make arms grow anywhere and then control them. Given that most of her crewmates are amusingly hyperactive dingbats, her relatively serene, contemplative presence is very welcome. You are currently browsing the The Manga Curmudgeon blog archives for the day Thursday, February 4th, 2010.